A sensory journey awaits you at the Caracalla Spa. Uniquely designed with a Roman theme and infused with an ambience of well-being and relaxation, the spa offers a holistic range of beauty treatments and unforgettable experiences guaranteed to keep you feeling reinvigorated. 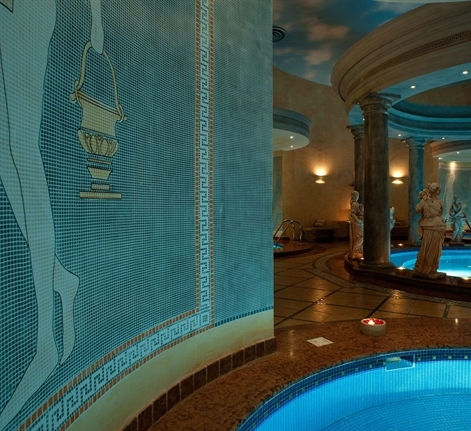 Situated over three floors, Caracalla, the hotel's spa and health club, is another retreat for the mind, body and soul. Product lines include Elemis, Aromatherapy, Fleur's and Coola. A selection of fresh juices as well as water are provided and any additional refreshments may be ordered from the Tea Lounge. Caracalla Spa A Sensory Journey Awaits You At The Caracalla Spa. Uniquely Designed With A Roman Theme And Infused With An Ambience Of Well-Being And Relaxation, The Spa Offers A Holistic Range Of Beauty Treatments And Unforgettable Experiences Guaranteed To Keep You Feeling Reinvigorated.